Thai style vegetarian noodles recipe,using Millet noodles,with video and step by step pictures. I wanted to post the popular Pad thai noodles. recipe. But the authentic pad thai recipe use fish sauce and other ingredients which i don't think i use in daily cooking. Generally i make hakka noodles for the kids using plain noodles or spaghetti. Rice noodles is not liked by kids so generally,i make South Indian sevai only using Rice noodles. I have tried the Vegetarian Bee hoon recipe using the brown rice noodles. 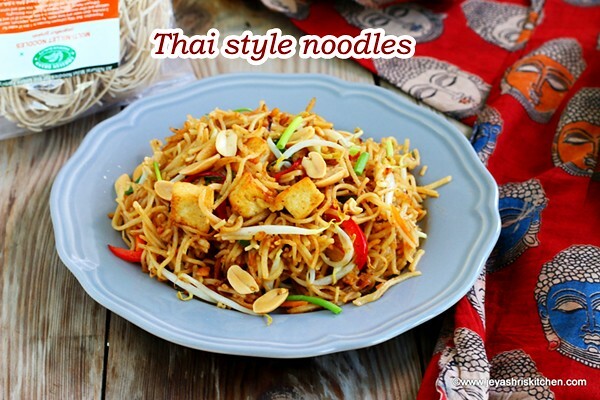 This thai style style noodles recipe is bit different from Bee hoon,as it uses peanut butter in it. 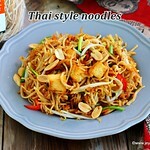 The sauce base which we use for this Thai veg noodles is quite interesting and it tasted so awesome too. The peanut butter didn't taste very strong in this recipe,so if you don't like the flavor of peanut butter also,you will like it. I tried this using Millet noodles recipe. Kids loved this and didn't found any difference. Udhayam Brand Millet noodles is available in Sri Murugan stores Singapore. They have outlets in Syed Alwi road and the new Sri Murugan plus opened in Simei also have a wide variety of groceries and fresh vegetables. They have a wide range of Millet noodles,like samai noodles, kuthravali noodles,kambu noodles and so on. I used Samai noodles for this Thai style veg noodles. This can be cooked in 2 minutes and doesn't need any steaming. Just boil for 2 minutes, drain the water and proceed with the making of noodles. Will share another interesting noodles recipe using their Millet noodles. This noodles comes with a taste maker inside the packet. But i didn't use that one. And the best part is it is not over priced,a pack of 200 gm noodles costs,1.80 SGD. You can download Sri Murugan Mobile app (both android and iOs version) and get your grocery by home delivery. Thai style noodles cooked in peanut butter sauce and veggies,used millet noodles to make it more healthy and a whole some meal. In a sauce pan add water and a drop of oil. When it boils add the Millet noodles in it. Cook for 2 minutes. Drain the water. Wash with cold water to remove the extra starch. Add 1-2 drop of oil to this. This is to avoid the noodles sticking with each other. Actually i wanted to try out a method,and it worked. Once the noodles is cooked and washed put them in a bowl of cold water. Drain and use once the veggie base is done. In this way it retains more moisture and also non sticky. Let's make the sauce for the noodles. Mix the peanut butter,jaggery and tamarind extract in a bowl. Add 2 tblsp of water and mix well. Sauce for thai noodles is ready. In a pan add oil and add the tofu cubes. In the same pan add the spring onion whites,slit red chili,garlic and ginger. Reserve the spring onion green for later use. Saute till the garlic becomes golden brown. Add the carrots and capsicum. Cook for few seconds. Add the peanut butter sauce to this. Mix nicely and cook for a minute. Add the cooked noodles to this. Add the tofu cubes,bean sprouts and spring onion greens. Cook for a minute in a high flame and switch off. You can use rice noodles also for this recipe. You can add blanched broccoli and thinly sliced zucchini too. Ensure that the noodles is cooked in medium high flame in all steps and not in low flame. 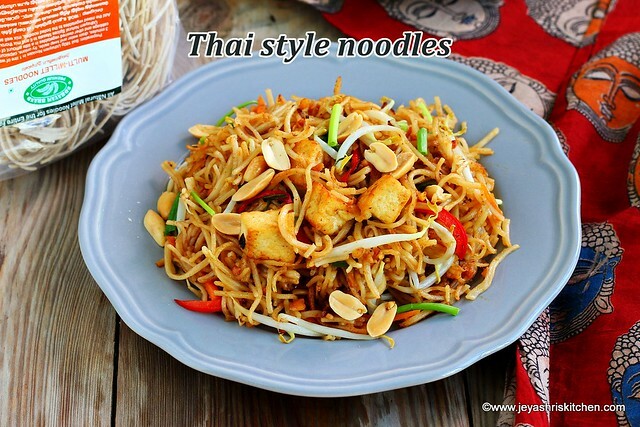 You can use 2 red chili as the jaggery in the peanut butter sauce balances the taste of the Thai Veg noodles.